Hello Brothers of 92. I am truly writing this “from the East” this time as I sit in Baltimore Harbor on the east coast where I have been seeing some early American and Masonic history this week. Just outside my window is Maryland’s historic Grand Lodge building which contains a replica room based on Rosslyn Chapel in Scotland. If I try hard enough, I can almost hear the cannon shots which once echoed across the harbor while Brother Francis Scott Key wrote the national anthem right up the street. At the start of the week, a Masonic funeral was held near here for John Paul Jones, American Revolution hero. It seems that the Brothers determined his Masonic services never took place. 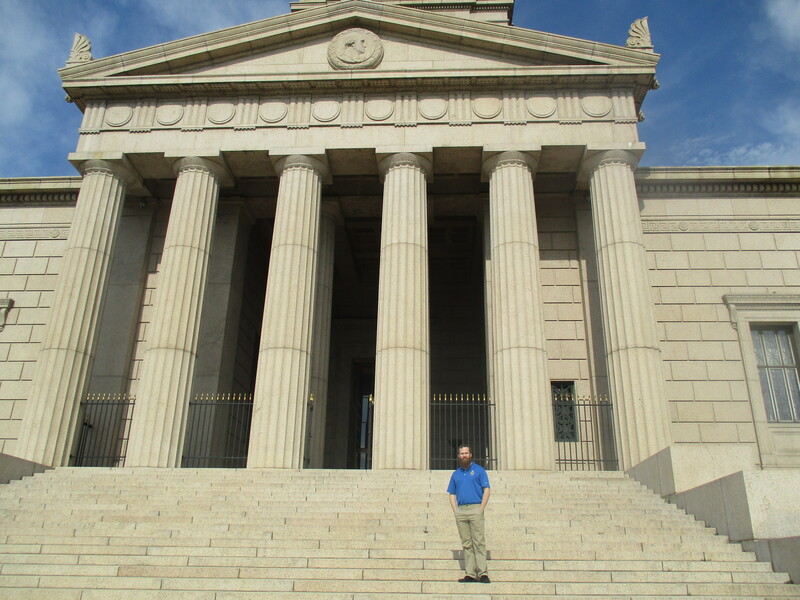 Of particular interest to 92, I visited the Washington Masonic Memorial in Alexandria, Virginia. In 1932, it was our own Past Master Alva Bryan who made his way out here for the purpose of conducting a special masonic ceremony that dedicated the building. I must stress that if any of you find yourselves in the D.C. area in the future, you must find the time to visit the Washington Masonic Memorial. You will remember that a portion of your degree fees was given to the upkeep of this building. 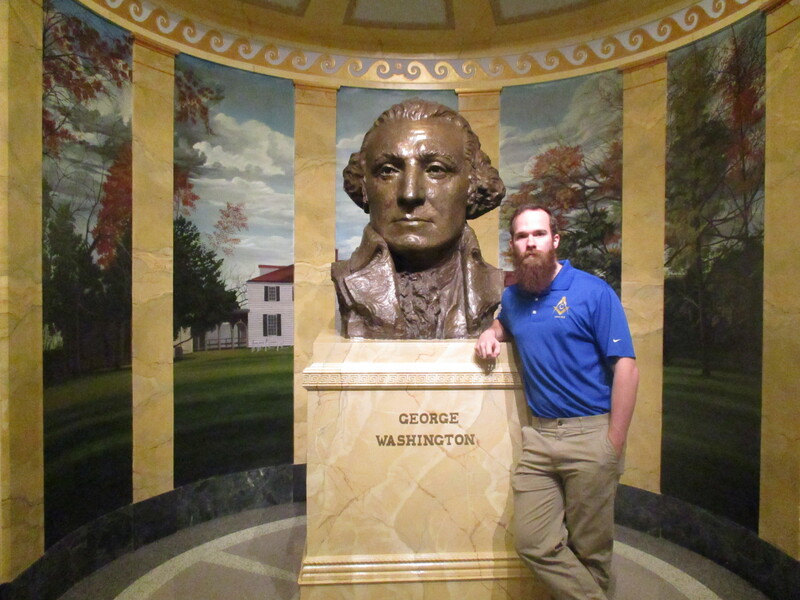 In it, Washington’s lodge continues to meet regularly and there are such treasures as his personal desk, a chair from his office sitting in the East, and various Masonic tools and regalia from his collection. When you walk into the main hall, there are three large stained glass windows on the right, each dedicated to an important figure in the Revolution. Centered is early American hero Joseph Warren, for whom our own Joseph Warren Speight was named. Upstairs, an entire booth displays artifacts from when Past Master Alva Bryan was here. Indeed, the mark of Waco 92 reaches far and wide, especially here in our nation’s capital. Back in Waco, we are staying busy. Three investigation committees will report at the next stated meeting and based on my communication with the candidates, I expect that we will be conferring three EA degrees in May. We also have two Master degrees coming up fast so contact me, Brother Senior Warden, or the Secretary and sign up for degree work! Please make it to the stated meeting as we are expecting a couple of special guests. One is a Brother traveling from a historic lodge in Louisiana who has personal ties to Waco 92 and the other is Nick Coker, a Baylor student who will present the essay on symbolism and allegory that caused us to award him with this year’s Pat Neff Masonic Memorial Scholarship. I would like to give a shout out to Jon Spann. On behalf of the lodge, he made sure that our beloved Pat Smith received the necessary attention in regards to her backyard fence. Also, he has successfully paved a new and remarkable parking lot at our longtime home in downtown Waco. Go by and see the beautiful symbols carved into the face of the parking structure at just a block away from the Grand Lodge where Waco 92 met from 1912 to 1969. It is neat to see our former home brought to life while we begin to update our current one on Cobbs. Masonry is alive and well. I hope to see you all very soon. dropped over Japan. 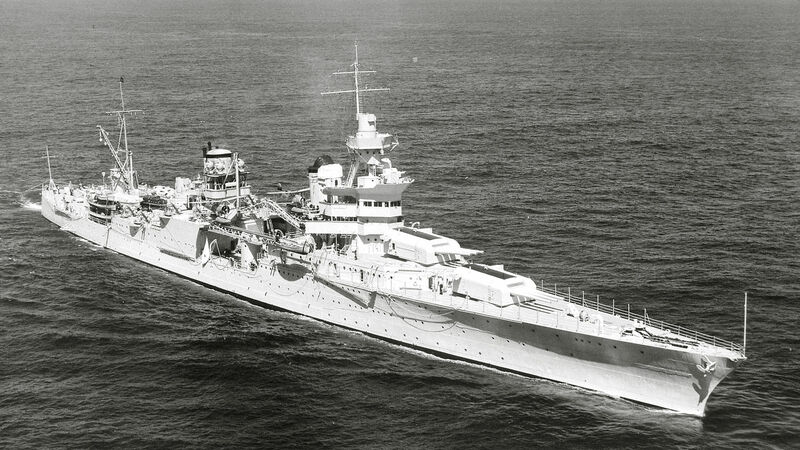 The USS Indianapolis was sunk just days after it delivered the bomb. I had the pleasure of meeting and talking with him during the game. He was seated in the aisle next to our seats. Why am I mentioning this? stated meeting, several of the members had the honor of visiting with Br. Fred Khoury in his home. He was unable to attend the April stated meeting for the lodge to present his 60 year Service Award Pin. It was an honor to visit with Br. Khoury. 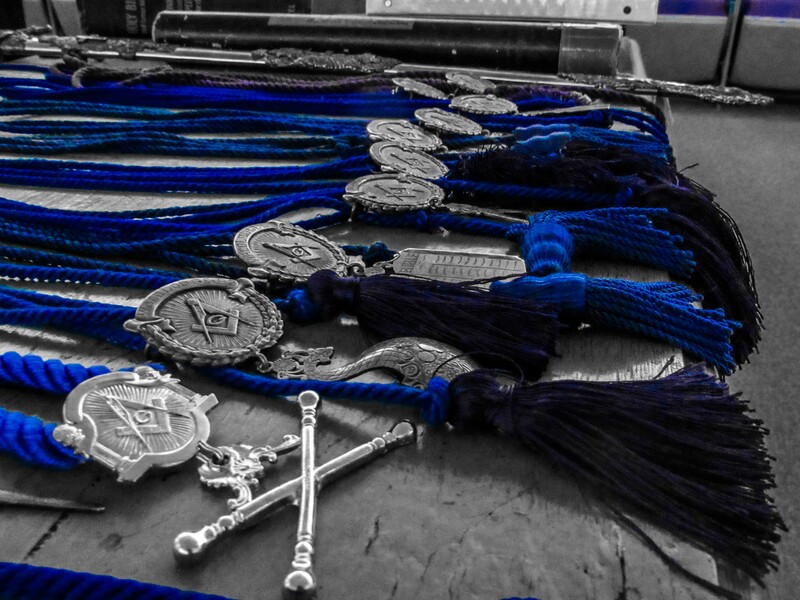 We asked him to reflect on his 60 years in Masonry. Some of the stories that he told about Waco 92 were heartwarming to say the least. Those two examples show us that we should not rest on our laurels, but to keep our fraternity growing and preserving the memories of our brothers from the past and the present. The dues are almost all in. I want to thank all the brothers for sending in the 2016 dues. We still have a few out, but hopefully they will be in before the deadline. This is just a reminder that the 2017 dues have gone up. They will be $100.00. The Grand Lodge assessment, which is optional when paying your dues, has also gone up in 2017. The assessment will be $27.50. The 2017 dues will be going out in late October or the first week in November. The Endowed, Life, and 50+ Year members will receive their 2017 dues card in the first mail out of the 2017 dues. All other dues cards will be mailed out after payment is received. 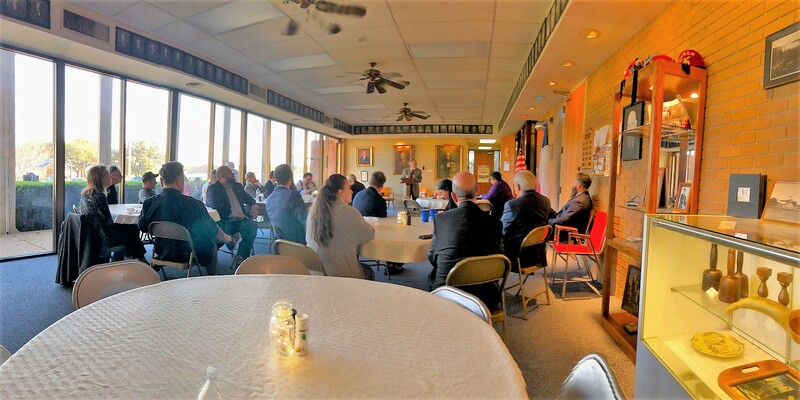 The April stated meeting saw a lot of accomplishments in the lodge. We gave four scholarships to four well deserved high school graduating seniors. Their parents were with them when they received the scholarship. Each recipient thanked the lodge and told a little about what they planned to do in furthering their education. We were also honored to present a 40 Year Service Award to Br. Bill Frailey. He thanked the lodge. 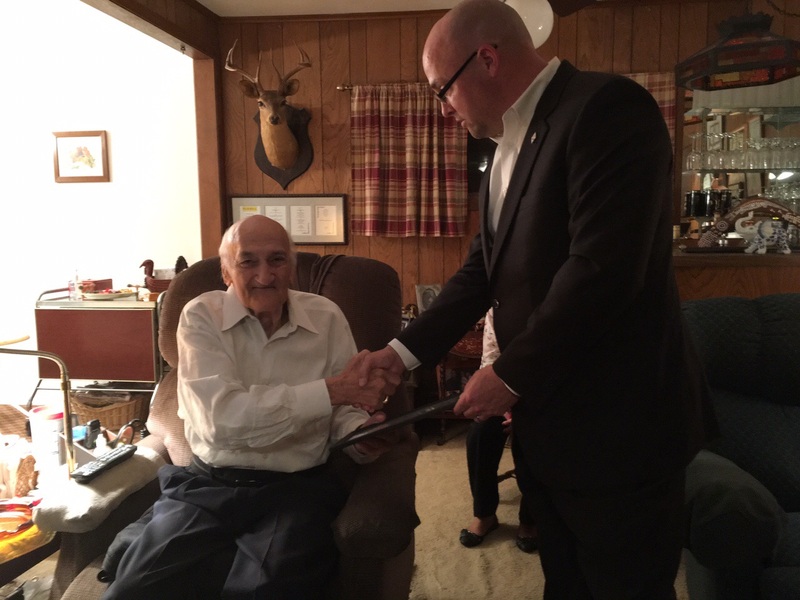 His son, a Master Mason at Fidelis Lodge #1127 was present to see his father receive his service award. Last, but not least, we read several petitions for the Degrees in Masonry at the stated meeting. We also had a couple of reinstatements that were acted upon. Brethren, the April stated meeting is what Masonry is all about. I must say that our April meeting was probably one of the best examples of Freemasonry that I have witnessed in a long time. Let’s keep up the great work. in the near future. A mail out will be sent out to the membership shortly to ask for donations to help with the roof replacement. When you receive the mail-out, please help with whatever donation that you can afford. The decision was made in our March stated meeting that Quebe Temple was the place that Waco 92 needed to be located at. To stay at our present location, we need to do some upkeep on the building. The roof is the main project right now. This is your lodge. Help us keep it in great condition so that present and future members of our lodge will enjoy a place that we can always call HOME. Sunday, May 8. Happy Mother’s Day to all our MOTHERS!